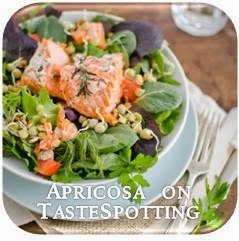 Apricosa: Baked donuts...a chocolatey sequel! Ever since I made those Baked Cinnamon Sugar Donuts, I knew I had to try a chocolate version. I loved the concept of a non-fried, yeast-leavened donut, and I couldn't wait to play around with new flavors. Just think, a homemade chocolate donut that's light and fluffy, baked not fried, and glazed with chocolate ganache. Since you won't have to worry about working with quarts of hot oil, this donut recipe is actually quite safe and easy to make. 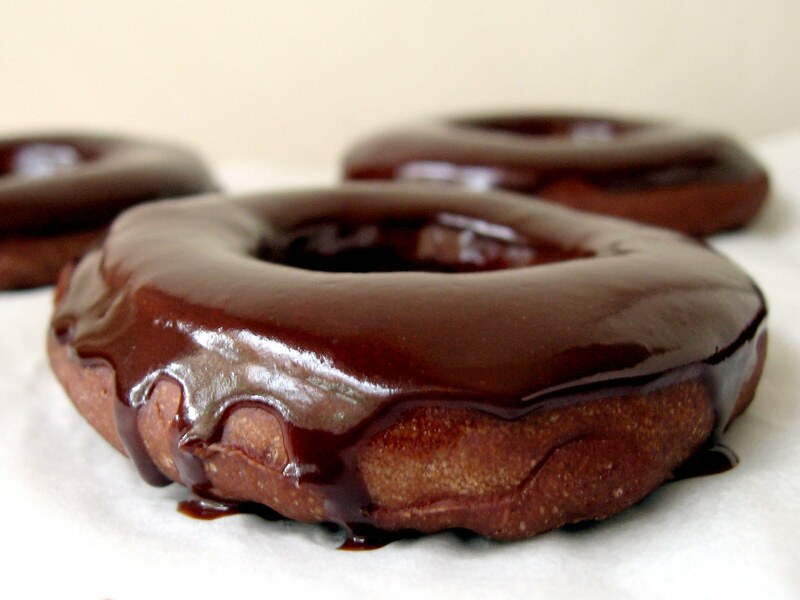 And they're healthy too, these chocolate donuts. Really. Since they're not fried. Right? Well, maybe the smooth and glossy, chocolatey ganache isn't the healthiest thing ever, but if you want to indulge, this sure is the way to go! Serve up these delectable donuts for dessert with an ice-cold glass of milk, or omit the ganache and enjoy them as a chocolate morning bread. Your tastebuds will rejoice. And so will your friends, when you bring them a tray of these donuts! 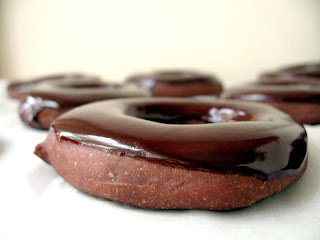 I used just half a teaspoon of instant espresso powder to deepen the chocolate flavor of the donuts. Feel free to consider this ingredient optional if you don't happen to have it on hand! Place 1/3 cup of the warm milk in the bowl of an electric mixer. Stir in the yeast and let sit for five minutes. If yeast does not bubble up, discard and start again with fresh yeast. Meanwhile, stir the butter into the remaining warm milk to melt it. Whisk together the sugar, cocoa powder, espresso powder, flour, and salt. To the softened yeast, add the dry ingredients, the remaining milk with melted butter, the vanilla extract, and lightly beaten egg and mix together with the paddle attachment to combine. Switch to the dough hook and continue mixing until dough is smooth and pulling away from the sides of the bowl, adding more flour if dough is sticky or more milk if too dry. At this point, you may either let the donuts rise for 45 minutes and proceed to bake them, or refrigerate them overnight. After refrigeration, let donuts rise 1 hour in a warm place. Bake at 375 F 8-10 minutes, then let cool for about 10 minutes. While donuts are baking, place the butter and whole milk in a small saucepan and place over medium-high heat, whisking constantly to melt butter and prevent the milk from burning. As soon as the milk reaches a boil, remove from heat and add chocolate chips, whisking until chocolate melts and the ganache is smooth and glossy. Let cool slightly. 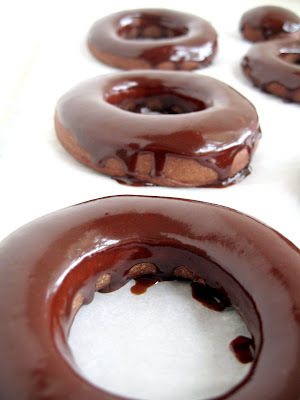 To glaze the donuts, invert each donut and dip into the chocolate ganache, allowing the excess chocolate to drip off before setting the donuts upright. Wohoo, that is what I call a chocolate dream! Sounds and looks amazing. Can't wait to try making them myself! Awesome!! Can't wait to try these out - they're my nemesis! ok, I'm definitely trying this! This is a great post, with clear directions and tempting photos, which make me want to prepare this right now! Congrats on FB Top 9 - you deserve it for this one. Now this is something I just have to try - thank you! i'm so making these. my family loves donuts and making them without hot oil is oh-so exciting! Mmmm...just made these again for dessert, with a scoop of vanilla ice cream and whipped cream! My brother had his with coffee ice cream and toasted chopped almonds. Wow, these look good! Beautiful photos too! mmmm mmmm they look so good. I guess that means I've got to try out this donut recipe too! I'm so excited to find this lovely "baked" donut recipe! I have been on the search for such a recipe!!! I made these today for my Belgian husband and his kids. They ABSOLUTELY loved them. It is a great change from greasy, heavy fried donuts. I have to admit they were a bit time consuming to make. Delicious! I will try a new homemade chocolate doughnut recipe SOON.